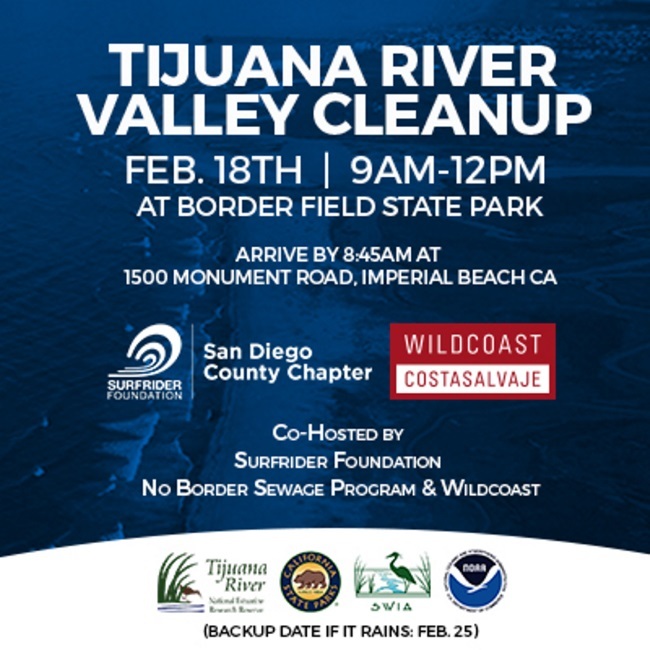 Register here for this cleanup event in the Tijuana River Valley. Who: Surfrider Foundation San Diego County Chapter, Tijuana River National Estuarine Research Reserve, CA State Parks and YOU!! When: Saturday February 18, 2017 from 9:00 am-12 noon. Why: Help us clean up one of the most environmentally degraded areas in San Diego County! Trash, sediment and waste tires routinely travel across the border and into this area with each rain event. Every scrap of trash and discarded tire we remove helps to prevent it from entering the estuary, beaches and ocean. # Please note that the date and location of this event are subject to weather considerations and may be changed if a rain event occurs or is predicted within 72 hours of the event time. +Volunteers under 18 yrs of age must have a signed waiver by parent or guardian. ++Volunteers under the age of 16 must be accompanied by a parent or guardian.